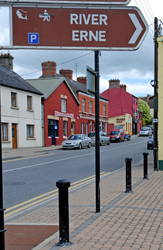 Belturbet lies at one of the best places for crossing the River Erne and is a busy angling town with a marina. It is 84 miles from Dublin on the main N3 route to Enniskillen and has been a major angling holiday centre for 40 years. The town has a population of approximately 1500. 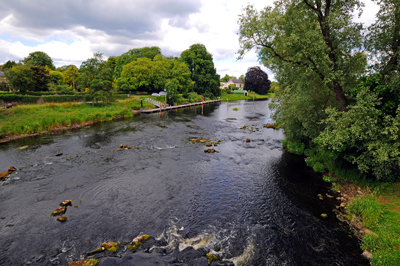 The River Erne has a nice flow through the town with plenty of easily accessed banks for several miles. Numerous lakes – in all shapes and sizes – have helped to make Belturbet one of the most popular destinations for UK anglers. Often overlooked these days, the River Erne is better than ever on the basis of quality roach and hybrids, backed with occasional big bream. A few years ago Coventry’s Phil Roxburgh celebrated his 40th fishing trip by catching a personal best bream of 9lb 12oz – a whopping great fish for Cavan waters. Mind you, while the number of bream being caught has dwindled, there is more quality and in the same session Phil had a second that took the scales at 7lb 9oz. He doesn’t want to pint-point the exact venue but says it is on the local fishing maps outside Belturbet on the Ballyconnell road. “I’ve been fishing the same venue for donkey’s years and this is the best single fish, though in three years ago I landed four between 6-12-0 and 9-2-0 and in the week had seven such big fish over three sessions”, he revealed. For the past two years (2011 and 2012) Alan Jones, the owner of Cazalan Guesthouse, which specialises in angling holidays, changed tack and instead of fishing from the shore he went by boat on to Upper Lough Erne for several successful sessions. Anchoring in the reeds he managed to catch big roach, hybrids to 4lb and several large bream. Alan has been gobsmacked by the quality of sport. And there is good news that a new angling tackle shop is opening at the site of the former McMahon’s Gun Shop, Bridge Street. There is also a brilliant “link” from Inland Fisheries Ireland with a list of 25 fisheries around Belturbet and a decent angling map to show the way.